Besides the standardization of communication objects CANopen specifies application objects used in various device profiles. These device profiles guarantee a defined device behavior and provide thereby interchangeability of CANopen devices. 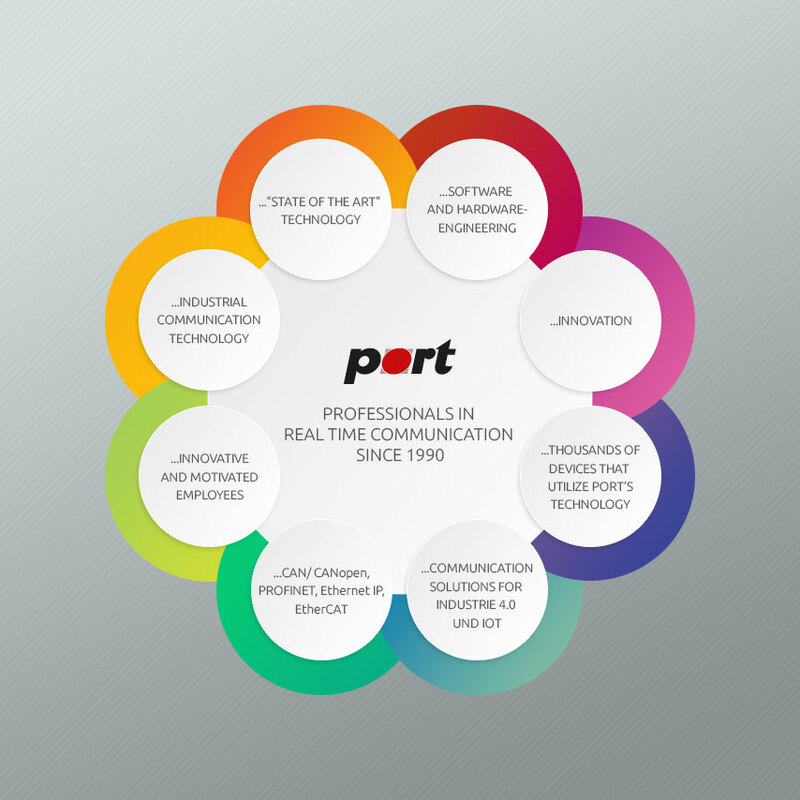 For employment of these profiles port provides extension modules for its CANopen Library. These modules make it possible to use the desired device profiles easily. All modules are available in ANSI-C source code and can be used with all versions of the CANopen Library. SDO transfers are based on the client-server model with a handshake after each transfer. For a larger block of data this will take a large amount of time. Therefore a new SDO mode has been defined in CiA 301 V4.x. It is called SDO block transfer. Using the block transfer a sequence of blocks can be transmitted without a large overhead. Each block is a sequence of up to 127 segments (e.g. CAN telegrams) containing only a sequence number and the data. If the application has a lot of data with the same properties a special PDO type can be used. It is called a Multiplexed PDO (MPDO). MPDOs transmit with every telegram the index and the sub-index of the given data. Therefore the maximum data length can be only 4 bytes. The transmitted index and sub-index can be the index and the sub-index of the producers object dictionary (MPDO Source Addressing Mode) or the index and the sub-index of the consumers object dictionary (MPDO Destination Addressing Mode). The package CiA 302 Flying Master is an extension to the CANopen Library library of port and provides functions for implementing the flying master functionality for CANopen devices. Flying master means that a second device in a network can take over the master role when the master dropped out. The application is informed about changes of the master state with indication functions. For employment of communication systems in maritime applications a redundant bus system is required. Because only the communication has to be redundant all services provided by CANopen can be used by this package. With function calls the redundant communication is handled automatically by the library. Information about other events in the different bus systems like drop out of one bus line, restoration of a bus line, missing communication and others are provided to the application with indication functions. Redundancy needs at least two CAN controllers. port offers implementations for stand alone CAN controllers as well as with microcontrollers with more than one CAN integrated. SDO connections exist exclusively between Client and Server. For the operation of configuration and analysis software as well as HMI which are only temporarily present in a network static SDO connections are not possible. For these cases the use of dynamic SDO connections is foreseen. With the extension module CiA 302 SDO Manager/SDO Requesting Devices the CANopen Library of port can be expanded to use this functionality. The application is informed about events by means of indication functions. The package contains source code, documentation and example programs for getting into it quickly. For a consistent state or error indication respective error diagnosis of CANopen devices the module LED is available. It is included in the default delivery of the CANopen Library. According to the specification of CiA 303-3 a NMT-LED and an Error-LED can be used as two single colored LED or as one bicolored LED. The state machine for controlling the LED is realized within the module. The desired configuration can set with the configuration tool. On state change of either NMT or error state the application is informed by an indication function which will then control the LED, i.e. switch on or off the appropriate LED. The LED module is alltimes delivered by the library. All monitoring functions can be realized with functions of the CANopen Library, but considering safety aspects monitoring functions should be implemented by the application developer. Consistency of the data in the object directory is achieved through further safety measures. With this all planned safety measures of the standard are realizable. The extension package LSS (Layer Setting Services) for the CANopen Library contains all functions to operate CANopen devices as LSS Master or LSS Slaves. With it unconfigured devices in a network can be identified by their unique manufacturer, product, serial and revision number and configured. After identification bit rate and node id can be configured for each device. Configuration with LSS can only be implemented on a CANopen master. With function calls existing slaves can be identified or addressed. In indication functions the responses of slave devices can be processed by the master. Responses of the LSS slaves to LSS requests of the master are generated automatically by the CANopen Library. Only when new parameters like bit rate or node id are set the application will be informed with indication functions. Delivery comprises source code, documentation and example code to get started quickly. This extension module for CANopen LSS functionality is included in the default delivery of the CANopen Library. The device profile for Generic I/O-Module is an extension to the CANopen Library of port and provides functions for realizing I/O devices that conform to the device profile CiA 401. The implemented functions realize the functionality as specified in the standard, i.e. logic operations, polarity switching, filter mechanisms, limit monitoring and others. The developer has to provide functions to access the hardware, ie. reading inputs, writing outputs. Delivery comprises source code and documentation. Drives Support is available from port in different ways. First of all using the CANopen Design Tool and its CiA 402 profile data base. Second, from a lot of implementations we did, we have some collected and assembled supporting functions in C combined in a CiA 402 framework. And third, our experience. Implementing drives and the CiA 402 profile is one of the most complicated programming tasks. For the test of an drives implementation according to CiA 402 the CANopen Device Monitor with its drive specific plug-in is suggested. Look at the drive state machine or the different movement modes in a graphical way.